My Grandpa turned 94 years old yesterday. My husband, our kids, grandkids, myself and his daughter went to visit him on Sunday to celebrate. His daughter took cake and ice cream to the assisted living facility where he lives yesterday for a party with the other residents. A few of his other family members attended as well. He seemed to have a good time. 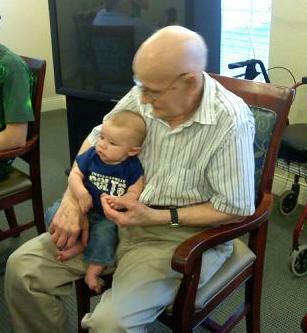 Grandpa and his Great Great Grandson. Base: 4 1/4" x 11"; scored at 2 3/4" and 5 1/2"